A while back, my keyboard became a source of anxiety. There was simply too much possibility, and indecision choked my ability to output. The coward I was decided to turn my writing efforts towards the safety of the analytical. And while that was fun for a while, I realized over time that I became bored with writing simply to write — something that became clear as I increasingly failed to lend anything substantive to an existing and growing discourse. Even a column initially undertaken for fun turned into something that felt, at least from the grip of my own pen, dry and manufactured — uninspired. In other words, I became comfortable, bored, and, even worse, irrelevant. My venture into pop media analysis, specifically dealing with Japanese cartoons, at least deepened my appreciation for poetry on some level. While consuming mass quantities of brightly colored animated series and movies, I noticed many instances of the honor given to poets and poems. Upon further investigation into name drops and quoted lines, I traced poetic evolution in Japan, discovered new favorite poets and poems, and became enamored of various poetic forms. I even toured a two-hour presentation on the importance of instances of poetry in Japanese animation (anime) to nothing but applause. (Plans are in motion to make a blog of “Poetry in Anime: the Power of Words in a Visual Medium,” as I believe the presentation has value for introductions and reference as well as generating general interest in poetry and animation.) But all of that effort was ultimately homesickness in the guise of big doe eyes gushing elephant-sized tears. I honestly don’t know if I have anything original to say anymore (or anything unoriginal to say originally). I know I certainly regret, or at least disagree in part with, (how I’ve said) some of the things I’ve published previously. To that end, I announce the forthcoming Delinkuencies: Legacies, Corruptions, and Future Shame — a collection of revisions and new poems. I’ve also retooled my website, Inksblot.com (v4.0), with a cleaner look as well as a freelance editing services section. While on writing hiatus, I’ve come to realize how much I enjoy working with others to make their words the best they can be. Doing so calls to me almost as much as creating original works does. So stay tuned. Newness is coming, but progress is a minute hand under constant watch. Oh, hi there. It’s been a while. It’s finally happening! “Death loves a Drinking Game” has a street date! and a party! But before all of that, I’ll be featuring at a lovely spot in Red Bank, NJ alongside two astounding poets from New Jersey’s Asbury Park scene: Joshua J. Ballard and Josh “Dogmatic” Matson. There’s even going to be a contest for a giveaway of an advanced copy of the new book! Details for that reading are here. 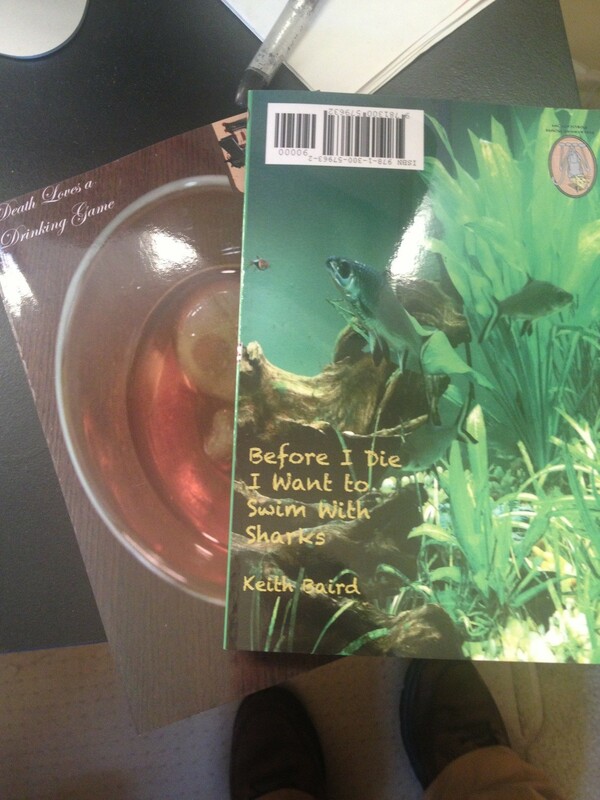 And now, the biggie: “Death Loves a Drinking Game,” one half of the Duel Book with Keith Baird’s “Before I Die I Want to Swim with Sharks,” is officially being released by Piscataway House Publications on January 18. There’s gonna be a party with poetry and music and a haiku deathmatch! Details are here. If you love me, I’ll see your face and sell you a book. First off, work on making Death Loves a Drinking Game into a Duel Book has begun by those tireless SOBs over at Piscataway House Publications! Initial choices have been made, plans for future roundtables have been scheduled, and interesting layout possibilities are being debated. Until that book comes out, I have been working (slowly) on new poems for you to enjoy. The new page to keep an eye on for this dribble of new content is Dumping Grounds. But poems aren’t all I’ve been up to. Recently, I had the chance to edit a book for a short story writer who has very quickly become one of my favorite contemporary short story writers. Well, I caught the bug and started writing a short story too. It keeps growing though and shows no signs of stopping, so what I’m tentatively calling “The Natural State of Things” might turn into a novella or worse: a novel. I submitted a stand-alone section of this work-in-progress to the Kenyon Review’s Short Fiction Contest, along with a newly edited version of “An Interview with Gretel.” As soon as they’re rejected, I’ll post links to both short stories on this blog only. The work on a new short story is exciting for me, mainly because of the endorsement/encouragement of the aforementioned author as well as the reactions to the snippet from a few select friends in whose unbiased opinion I trust wholeheartedly. Also, I’d like to think I’ve grown as a writer since the labored short stories that appeared in Tripped Tongues & Fallen Cases. The Tenth Anniversary Poetry Festival: A Celebration of Literary Journals will take place On May 19, 2013 at the West Caldwell Public Library in New Jersey, and I’ll be one of two readers representing the Edison Literary Review at the showcase event. The editors of the Edison Literary Review, in addition to publishing a couple of my more usual poems in previous issues, recently stepped outside their normal publishing criteria comfort zone to place a haiku of mine within an upcoming issue. Gina & John Larkin and Tony Gruenewald are a fantastic team that puts out a quality literary rag (subscribe! ), and I couldn’t be more honored that they’ve chosen me to read on their behalf at such a defining event. Speaking of haiku, there was a slam put on by Suffern Poetry at the Elk Lounge in Hoboken, NJ this past Saturday evening. It was the most intense slam I’ve ever attended, which I chalk up to the impact inherent in such short poems as well as cunning choices made in each round regarding tone of topic. It wasn’t a classic haiku slam, but that didn’t stop the daring from bringing out classic haiku here and there. Highlights included a father-son duel, short jokes, STD jokes, all the laughs and all that glorious tension! Also, Mark Brunetti was stalking EVERYONE. You can check out the fruits of his photophilia here. Recently, I edited a book of poetry for 2012 Asbury Park Poet Laureate nominee Joshua J. Ballard. There’s gonna be a release party on January 30 for I Keep Going to kick-start his next tour, and the author was kind enough to ask me to perform as part of the 5, 7, then 5 (buy via amazon) collective. Several other poets, bands, and artists will be there, so come on out! It’s also my last appearance in 2012 and might also mark my extended retirement from the scene as a whole. So come glimpse my majesty while ye may! In other news, Death Loves a Drinking Game has been pushed back a little for a 2013 release and is now to be paired with the work of the stunningly touching and immensely talented Keith Baird! Look for more on that as news becomes available. Hope you have a grand send-off to 2012 and that 2013 treats ya right.